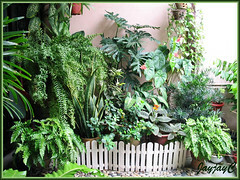 Ferns are must-have for our tropical garden, otherwise it appears incomplete! We simply adore these elegant ornamental greens! 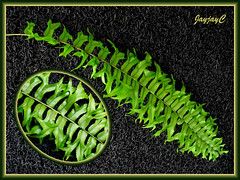 Fishtail Sword Fern is one such beauty that is just great for any garden landscape. 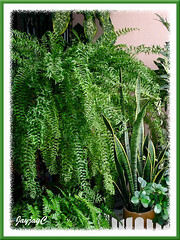 It is quite a large fern that can be potted and placed on a high metal stand, to best accentuate its wonderful cascading fountain-like display. Plant type: Terrestrial or epiphytic fern, native to New Guinea and Australia. It is widely cultivated in the tropical and subtropical regions for its ornamental foliage. Features: Nephrolepis falcata is an exceptional species of the genus Nephrolepis Schott, the only one out of about 30 species of this group of ferns that has forked pinnae tips. It is reckoned as a cultivar of Nephrolepis biserrata (Giant Sword Fern) that had escaped cultivation but not considered invasive and was previously named N. biserrata cv. furcans. 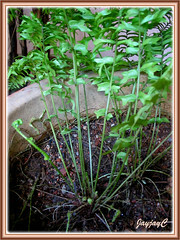 A fast-growing, medium to large-sized tropical fern that is an evergreen perennial in warmer climate, whilst a tender perennial in colder regions. This herbaceous plant produces tufted stipes (10-25 cm long) with pinnate fronds that are broadly lanceolate (35-120 cm long and 9-11 cm wide) and tapers towards the top but marginally towards the base. Fronds are bright green or yellowish-green in color and can be erect though usually pendulous. Numerous sessile pinnae with serrated edge are held alternate or opposite along the rachises that sometimes do fork too. The basal pinnae are much smaller and distant as compared to the central pinnae (4.5-6 x 1.5-1.8 cm). Nephrolepis falcata can be easily identified by its characteristic undulated pinnae tips that fork 1-3 times, appearing fishtail-like or falcate (sickle-shaped), hence led to some of its naming. It has a short erect rhizome that is covered with dark brown scales, producing long threadlike stolons from which young plants emerge along its length. Sori, round-shaped, are borne on the underside of pinnae, along the margins. Culture (Care): Nephrolepis falcata grows easily with minimal maintenance. Light: Bright light or bright filtered sunlight for best growth, though can tolerate full sun and even light shade to full shade. Moisture: Medium water requirement. Keep soil moist but not waterlogged. Loves a humid environment, so mist foliage frequently if weather is hot and dry. 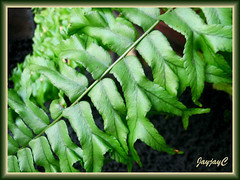 Others: Pinch off older discolored fronds to maintain tidiness. Shower the foliage regularly, especially during dry weather to remove dust, provide humidity and keep it luxuriant. Browning tips and yellowing fronds are signs of dry air. Feed monthly with a balanced liquid houseplant fertilizer. No known garden pests or diseases. For subtropical regions: USDA Zone 9a-11. Check at Dave’s Garden for more information. Propagation: Can be propagated by germination of spores. Learn how-to here. Another easier method is by removing young plants that emerge along its creeping stolons and plant them as new plants directly on ground or in pots filled with gardening soil. 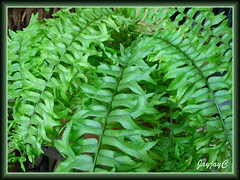 Usage: Fishtail Swordfern makes excellent container plant for porches, decks and patios or indoors in homes, offices or greenhouses. 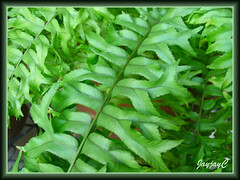 Ideal fern for landscaping or grown as ground cover in garden beds or borders, be it in sunny or shady sites or woodland garden. It is great in hanging baskets too. Cut fronds are lovely addition for floral arrangements. Nephrolepis falcata or N. biserrata ‘Furcans’ is known to have nutritional use where leaves are boiled and eaten as veggies and roots pounded to flour. Besides, some fern parts are utilized as traditional medicine in certain regions for treatment of boils, sores, wounds, etc. More info here. Its close relative, Nephrolepis exaltata (Boston Fern) has been tested and found to be one of the best plants for removing air pollutants especially formaldehyde and raising humidity levels. Does N. falcata or Fishtail Fern do that, I wonder? IFAS, University of Florida, an interesting read on distinguishing native and non-native Nephrolepis spp.